A girl with an unknown destiny. A boy from a hidden world.When Celeste starts at a new school in a small, Kansas town, she hears whispering voices, has vivid nightmares, and swarms of blackbirds follow her every move. She is oddly drawn to aloof Rylan, the other new student who has his own secrets.The exact moment she turns seventeen, she wakes to a bedroom full of strange creatures, purple light emanating from her hands, and Rylan breaking in through her bedroom window. He knows what she is . 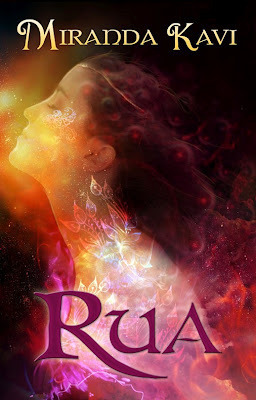 . .
Intriguing and deeply romantic, RUA is page-turning YA novel with a supernatural twist. Miranda Kavi is a YA and Urban Fantasy author. She has worked as an attorney, an executive recruiter, and an assistant in a biological anthropology lab. She loves scary movies, museums, and is hopelessly addicted to chocolate. She lives in the Houston area with her husband and daughter. This entry was posted in Book Tours and tagged books. Bookmark the permalink. Hi I could do Sept 30th on my blog. I’ve gone ahead and filled out a form. Thanks! I would love to fill the October 3rd slot. My membership as a host was just submitted a few minutes ago and I’m waiting on acceptance but I wanted to let you know that that spot would be perfect!